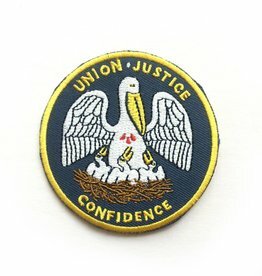 This is our hand-illustrated take on the beautiful Louisiana State Seal which features the pelican in her piety, sacrificing for the greater good. Basically, she's totally a team player, we admire that. This is one of our most popular designs. Printed at our shop in downtown Lafayette, Louisiana.